I am not sure if you are aware of this but ISKCON has a policy of “revising” Srila Prabhupada’s books. They are making unauthorized changes to Srila Prabhupada’s books. For example now the Bhagavad-gita ISKCON distributes has thousands of unauthorized changes that in many cases significantly change the meaning of what Srila Prabhupada said in his original Bhagavad-gita As It Is. This “original manuscript” is a great deception. This is not the “original manuscript” at all. That is only the first draft of the book. Srila Prabhupada worked extensively on this “first draft” with his editor Hayagriva Prabhu and the result is Srila Prabhupada’s “Complete Edition” of his Bhagavad-gita As It Is published by Macmillan in 1972. Govinda dasi, in her very important letter below, gives personal eyewitness proof that Srila Prabhuapda spent a lot of time working with Hayagriva Prabhu, the principle editor of Srila Prabhupada’s books, to take his Bhagavad-gita As It Is from the first draft to the manuscript that was presented to Macmillan to print the book. What was approved by Srila Prabhupada for printing was the blueprint of the book provided to him by Macmillan, not his first draft. Srila Prabhupada was personally involved in all stages of writing, editing and printing his original Bhagavad-gita As It Is, he lectured from this book constantly from 1972 to 1977 and personally read the book in his leisure time. With the exception of a few obvious typographical errors he never authorized any changes to this book. He certainly never autorized anyone to “Revise and Enlarge” it. If you look at your ISKCON Bhagavad-gita you will see it is now “The Revised and Enlarged” edition. This is not authorized by Srila Prabhupada. This is the most important issue facing ISKCON. 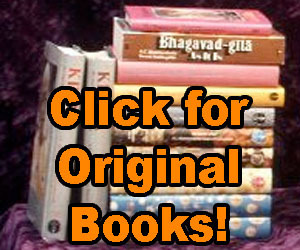 ISKCON is changing Srila Prabhupada’s books. No matter what happens we have to preserve and distribute the original teachings of Srila Prabhupada and the main source of these teachings is Srila Prabhupada’s books. To research this matter further. And had these two errors been corrected, along with any misspelled words, etc. there would have been no cause for alarm–or for a million dollar lawsuit with… bbt defending the edited version–one which they lost in the courts. That court case is the only reason that now the world has an option to read Prabhupada’s original words. But the 5000 changes that were made, and changing the “writer’s voice” was unwarranted and factually criminal. But as soon as he could, he printed his manuscript in total, the Original Gita, the one with Jadurany’s reddish battlefield picture on the cover. Srila Prabhupada was extremely happy with that Gita–he finally got his carefully nurtured manuscript into print! He was overjoyed! Jayadvaita M. had not even become a devotee in early 1967, so how would he know?? He says many things that are not in keeping with what really happened, since he was not there; perhaps he is relying on hearsay, I don’t know. Neither was Jayadvaita M. in Los Angeles in late 1968 when Hayagriva lived with us for weeks on end, completing the editing work. Most of what the bbt says in this regard is based on fairy tales, hearsay, and perhaps some personal ambition as well. I do not know how they can skew things in this way and still sleep at night. Now, you may enjoy reading many various literatures that are perhaps well written, even better written, and that is fine. But if you want to read Srila Prabhupada’s original words, gone over with a fine tooth comb by Srila Prabhupada and Hayagriva, then I suggest you read his original books. If you want to compare them, that’s fine too. But his original books must be available to the people who will come in the future of this Kali Yuga. And the changes must stop lest the original teachings be obliterated in the course of time. Generally I avoid these political issues, as I feel most are fairly unimportant and always changing. However, this book issue is very very important. So important that Srila Prabhupada himself came to me in a darshan a few years back and told me to defend his original books. Frankly, I did not want to take this task, as it means stepping on people’s toes, but he insisted. He ordered me to speak out, so I must, in spite of being labeled and criticized. Srila Prabhupada wants it known all over the world, and especially for future generations, that his original books are just as he intended them to be. They have his full shakti, full mercy, and are for all of mankind. If the changes continue, there will always be another editor who thinks he can improve this or that, and eventually the original meaningswill be lost. You may appreciate the editing work, but Srila Prabhupada doesn’t. He didn’t appreciate the changes then, and he doesn’t appreciate it now. Our duty is to please our Guru, not our own sense of what sounds good or doesn’t sound good. He made this clear so many times, yet they have chosen to ignore everything he said. Please understand, I don’t blame any one person, not even Jayadvaita M. It is the nature of the Kali Yuga to try to destroy that which is sacred and meant for the upliftment of mankind. That is how Maya works. what do we have to do to get this done. I know little about krshna and anything that has been carried on from our ancestral history. I would like to be able to help preserve Srila’s Writings because this is all that is left of our times written scriptures. to change to better appropriate the understanding of next generations is to repeat the same mistake we have done in writing before. We do not produce the same vehicles that would be detrimental to our own we should not reproduce someone’s writing becaus it is their own and not one else’s written for reason’s unknown. this is not some big adults toy, a playful amusing bet, or even something that shouldn’t be taken lightly to trial. it is one’s writing that has been published just like it is not to be played with. turned over to be brighter or eve re-written like the Holy Bible. I believe people of this world and all communities should only be allowed to Change their own works of writing for their own selfish-selfless reason’s and not someone else’s writing that has been published in this day and age of era.True or Not True? if I am wrong by all? do as you wish! if I am false then please revise me and my works but not Srila prabhupada’s. I was born in Americ as he was born in his birthplace. we are two different cultures years apart believin that it is wrong to put your own twist on someone else’s work. . .technology is a must to change, migration can be a must of changing habitats for whatever the reasons may have been, which we do not see anymore FYI, but we do not change author’s writings unless itwas demeaning or brought up negative energies around the globe. and if any of his writings do well take it into consideration that life isn’t always peachy-keen and can be happy all at the same time(s)!